NSW police now have special emergency powers to bug or track people for up to four days without a warrant. Under the biggest shake-up to the state's surveillance laws, police will have up to four days to monitor people before needing to apply retrospectively for an emergency warrant from a Supreme Court judge. 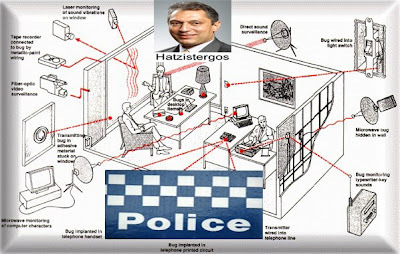 NSW Attorney-General John Hatzistergos said the new police powers flowed from an inter-governmental Australian terrorism summit in 2002. "I don't believe the threat of terrorism has disappeared," Mr Hatzistergos said. "The law says the emergency powers may be used if there is an imminent threat of serious violence or substantial damage to property, or if a serious narcotics offence could be committed. "To adequately track and prosecute terrorists, we need to be able to monitor computers, as well as be able to watch and listen with whatever means available." Mr Hatzistergos said police would come under the full scrutiny of the issuing judge and be audited by the Ombudsman. Reports would also be made to the Attorney-General and State Parliament. Only material relevant to a possible prosecution could be kept and it must be stored in a secure place. If a judge refuses to grant a warrant, all records gathered must be destroyed. 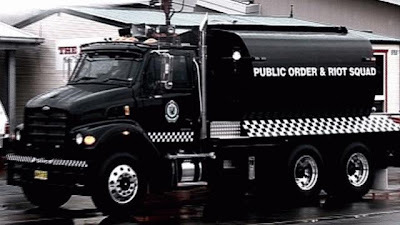 Under the Surveillance Devices Act 2008, which came into effect on Friday, NSW Police can now also cross state borders, and the operational time for surveillance warrants has risen from 21 days to 90 days. 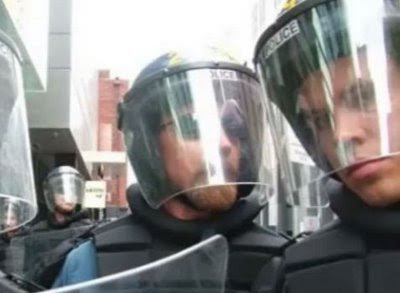 NSW Council for Civil Liberties president Cameron Murphy said the new powers were a massive reduction in police accountability to the community. "We have seen a number of high-profile police in NSW and Victoria in trouble," he said. "It raises the question: 'Can we trust them with these powers where there is an accountability-free zone?' 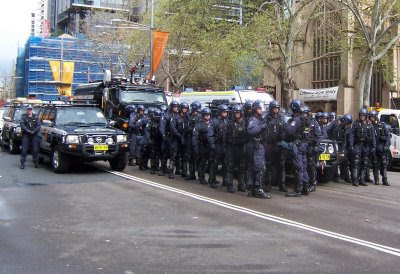 "
Each member of the public order and riot squad is kitted out with more than $8500 in gear. The squad's commander, Chief Superintendent Steve Cullen, who has been in the force for 30 years, said there had been extraordinary developments in protection gear in that time. "Back in the '70s and '80s, there was a tactical response group but, of course, they were never kitted out to this extreme," he said. "There would have been perhaps an improvised army helmet, an old-type ballistic vest and a Remington 870 pump action shotgun. Not much else." He said the new equipment showed the world had become a "far more dangerous place than it was 20 years ago". "What we are wearing is a direct reflection of society today. I have seen an escalation in violence towards police and a loss of respect for law enforcement in general." 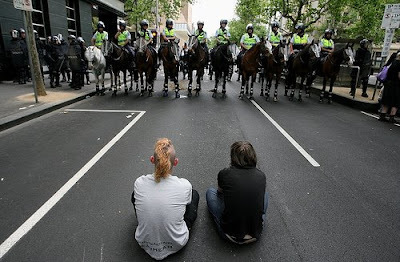 Two protestors sit in front of a line of police at the end of a day of demonstrations and violent clashes between protestors and police near the venue of the 2006 G20 Summit, Melbourne, November 18, 2006. During the 30 August to 1 September the Forbes Global CEO Conference in Sydney. Police outnumbering surrounded protestors. For instance attend some demonstrations or protests (left Wing) to be surrounded by police bridging up. 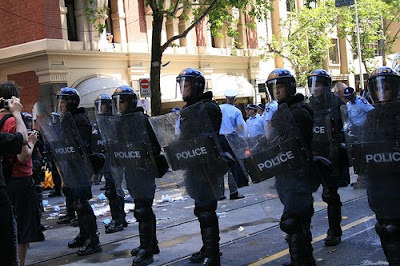 If a police officer is confronted with a "high risk" situation, the Public Order and Riot Squad is called in. The unit is able to quickly deploy up to 75 fully equipped officers. That number is planned to increase to 100. "We get called to public disturbances, brawls, sieges, riots, protests and demonstrations, but we are fully prepared for any other high-risk scenario that could possibly come our way," Superintendent Cullen said. Protected by a bulletproof vest, ballistic goggles as well as arm and leg guards, each riot squad officer is essentially a "mobile arsenal vehicle". The officers' chief weapon is a Glock 22 semi-automatic pistol. Strapped to their flameproof overalls, they also carry the much publicised X26 Taser electric stun gun. It fires needle-tipped darts that disable violent suspects with a high-voltage shock. Officers also carry a bigger version of the traditional capsicum spray bottle, spare rounds of ammunition, a short baton, long baton, utility knife, handcuffs and cable tie flexi-cuffs. Squad member Sergeant Andrew Grace said fully fitted-out officers needed to drink 1.5 litres of water an hour to combat dehydration. "If it's a situation like a Redfern or a Macquarie Fields [riot], the last thing you're thinking about is the additional weight. It's never a consideration. You're totally focused," he said. Superintendent Cullen said today's uniform was all about "protection and having a number of less lethal options" available. "If they are heading out in the full kit, it's based upon the risk of the threat confronting us at the time." He cited last year's APEC demonstrations in Sydney as an example. "We had significant intelligence that there were people intent on causing violence and damage." 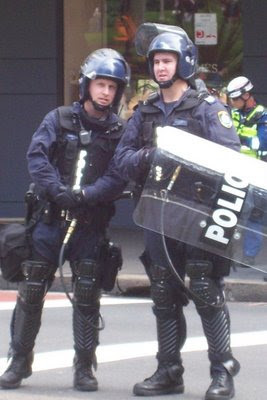 NSW Police unleash their latest weapon against unruly protestors just in time for APEC. Superintendent Cullen said the first response in any volatile situation was still "the mouth". "You never stop talking to people. That's what it's always about and that's how you always hope to resolve a situation, regardless of where you are." Quote: Significant literature shows that if people are not treated with respect by governments and authorities by using dialogue to solve problems - then police-using violence against them only drives a wedge and doesn’t provide for any long-term solution to community concerns. Violence does not win so why not lead by some form of example? Violence begets violence. If the military, police and governments use violence against people then how can they expect the community to learn that violence does not win? Isn’t that what they are trying to prevent? Note: that having no access to demonstrate leaves room for people who want to break through baracades. Why not just invite elected democratic representatives for the people to the conference? Why not provide public space close to the venue for people to demonstrate their concerns? 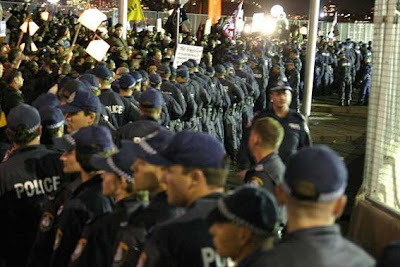 CONTROVERSIAL powers granted to NSW police during last year's APEC summit are likely to be made permanent - or at least available to police for any special event - under a proposal to be taken to state cabinet. The powers made it possible to exclude people from certain zones during the Asia-Pacific Economic Co-operation summit in September. Police were given extraordinary rights to search people. The QUICKTIME REPORT You Tube 20/11/06 - SEE GLOBALLY! A review of news, opinion and photography recorded from the Indymedia Newswire. Free to rebroadcast. The world & recorded for the community archive! November 20 2006.